Beautiful 18th C.House in Center of Seville:Terrace &Free Wifi. 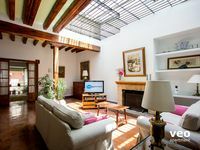 Property 4: Beautiful 18th C.House in Center of Seville:Terrace &Free Wifi. House with private garage and terrace, close to everything! Free fiber wifi !! Property 9: House with private garage and terrace, close to everything! Free fiber wifi !! Apartment in Triana less than 5 minutes from downtown. Property 17: Apartment in Triana less than 5 minutes from downtown. SPECTACULAR 3 BEDROOMS HOUSE, 2 PRIVATE TERRACES. Property 24: SPECTACULAR 3 BEDROOMS HOUSE, 2 PRIVATE TERRACES. Property 26: Newly renovated in city center - can accommodate up to 8 people - ask owner! Property 40: "Great Andalusian house"
There were six of us and this flat was the perfect place for us. It was comforting to be able to come back to our own space at the end of each day. Everything we needed was there. It took us awhile to figure out the washer and dryer but we finally did. A couple of us got food poisoning one night and it was wonderful to be able to stay in one comfortable spot to recuperate. The flat was in a great location to be able to walk everywhere. The managers were excellent in customer service. Attentive, gracious, and caring. I would highly recommend this place and I hope to come back to it again.